It’s a bee! No, it’s a fly! Have you ever seen a fly masquerading as a bee in the garden? If so, then you may have encountered a flower or syrphid fly. More than 130 species of flower flies are found in Maryland, and these animals serve both as important pollinators as well as predators in the garden. Flower flies (family Syrphidae) are found throughout North America and often have conspicuous yellow or white and black stripes, which mimic the warning colorations on some bees and wasps. This mimicry coupled with buzzing noises often make flower flies less appealing to predators like birds. Unlike most bees, however, flower flies will hover over plants before going into consume nectar or pollen. 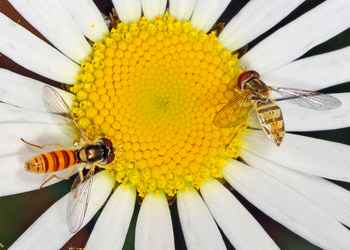 Because of this trait, some flower flies are known as hover flies. Most flower flies in Maryland are less than 3/4 an inch in length. Across the world, flies serve as important pollinators and assist with pollination of economically important plants like cacao (aka chocolate!) Flower flies feed off plants that have readily accessible nectar or pollen like violets (Viola spp.) and an assortment of asters. As juveniles, flower fly larvae have very different feeding strategies than adults. Some flower fly larvae (maggots) are scavengers while others are predators. Flower flies in the genus Copestylum often sneak into bee or wasp nest to lay their eggs. Upon hatching, the larvae will feed on dead bees and other decaying material in the nest. 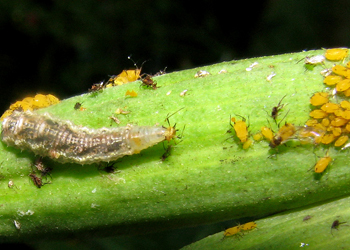 Other flower fly larvae feed upon soft-bodied creatures like thrips and aphids, including the non-native oleander aphids often found en masse on milkweed plants. Occasionally, butterfly eggs or early instar caterpillars will also be consumed by flower flies, but the few lost butterflies are not a cause for concern. To attract flower flies to the garden, include plants in the carrot (Apicaceae) and mint (Lamiaceae) families like bee balms (Monarda).